If you have had a breast biopsy or surgery for breast cancer (either a mastectomy or a lumpectomy), one of the first things that are done is to determine the hormone receptor status of your tumor. Hormone receptor status, in turn, is very important in choosing the best treatment options for your cancer. Let's take a look at the different hormone tests, what a positive or negative status means, and how this affects your next steps in diagnosis and treatment. Estrogen and progesterone receptor tests are "biomarker" tests that are done on all breast cancers. These will appear on your pathology reports after both a biopsy and after surgery. Receptors are also retested if you ever have a recurrence, as they can change if a tumor recurs or spreads. Hormone receptors are determined with the use of a microscope on a biopsy sample. Estrogen and progesterone receptors are proteins that are found on the surface of breast cells. Estrogen and progesterone attach to these receptors (like a lock and key) to signal the cell to grow and divide. All breast cells have these receptors, but they are found in much greater numbers on breast cancer cells which are considered positive. In order to block the signal created when estrogen or progesterone binds to these receptors, it's necessary to do one of two things. You can either reduce the amount of estrogen in the body (through ovarian suppression therapy before menopause or using an aromatase inhibitor after menopause) or block the receptor so that estrogen that's present in the body cannot bind with the receptor. Breast cancers which are estrogen (and/or progesterone) positive are "driven" by estrogen. Not all breast cancer cells are driven by estrogen. Some breast cancers are instead HER2 positive. With these cancers, growth factors in the body bind to the HER2 receptors on the surface of the cancer cells to drive the growth of the tumor. Some breast cancers do not have either of these receptors and are referred to as "triple negative" cancers. Some breast cancers are both hormone receptor positive and HER2 positive. With these cancers, the cells may be stimulated to grow by either estrogen/progesterone binding to the estrogen or progesterone receptors, or by growth factors binding to the HER2 receptors. These cancers may be referred to as "triple positive" breast cancers. (Learn more about the role of estrogen in breast cancer). A score of Estrogen Receptor positive (ER+) means that estrogen is causing your tumor to grow, and that the cancer should respond well to hormone suppression treatments. If the score is Estrogen Receptor negative (ER-), then your tumor is not driven by estrogen, and your results will need to be evaluated along with other tests, such as your HER2 status, to determine the most effective treatment. When Should You Ask for a Numerical Score? If your hormone status tests are scored only as negative, it is good to ask your doctor for a number that indicates the actual score. Even if the number is a low one, the cancer may effectively be treated with hormone therapy. 3+ is a large number of receptors. You may also find the number of cells out of 100 cells that tested positive for hormone receptors. This is written as a number between 0 percent (no receptors) and 100 percent (all cells have receptors). If your tumor is ER+ and/or PG+, hormonal therapy is usually recommended. The choice of medications, however, depends on your menopausal status. Before menopause, the ovaries produce the greatest amount of estrogen. To prevent this estrogen from combining with cancer cells to make them grow, a medication called a selective estrogen receptor modulator is used. These drugs, like tamoxifen, bind to the estrogen receptor so that estrogen cannot bind. After menopause the situation is different. There is much less estrogen in the body. Instead of the ovaries producing estrogen, the primary source of estrogen in the body is the conversion of androgens (male-type hormones) into estrogen. This reaction is catalyzed by an enzyme known as aromatase. Medications called aromatase inhibitors can block this enzyme so that estrogen is not produced, and cannot bind to cancer cells to make them grow. Aromatase inhibitors may sometimes be used in premenopausal women after ovarian suppression therapy. First, medications are used which prevent the ovaries from making estrogen. (Another option, though not the first choice, is to remove the ovaries). Then, a woman may be switched from tamoxifen to one of the aromatase inhibitors. Doing so appears to have a survival advantage for some women with breast cancer. There are other hormonal therapies which may be used at times. Faslodex (fulvestrant) is an selective estrogen receptor down-regulator (SERD). It may be used for women who have progression of their cancer while on tamoxifen or an aromatase inhibitor. In addition, there are other hormonal therapies for metastatic breast cancer that may be considered for some people. With early-stage breast cancers which are estrogen receptor positive, hormonal therapies can reduce the recurrence by roughly half, whether it is tamoxifen used for premenopausal women or aromatase inhibitors used for those who are postmenopausal. 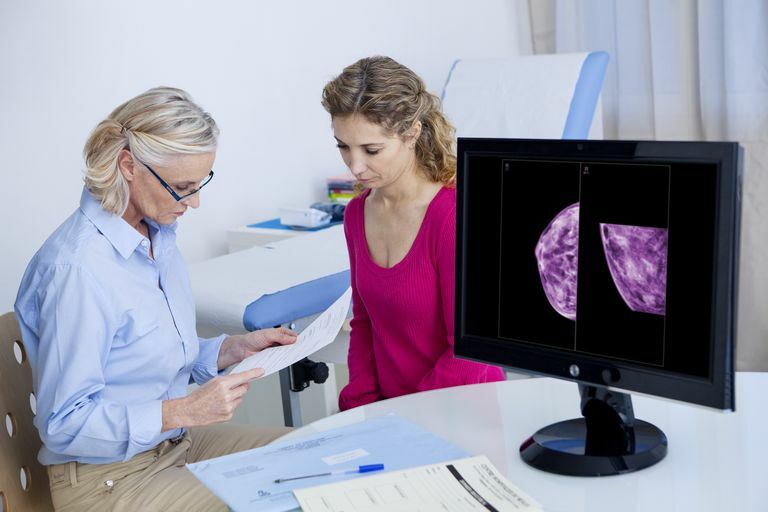 Recently, bisphosphonates have been added in along with aromatase inhibitors for early-stage postmenopausal breast cancers which are estrogen receptor positive. When used along with aromatase inhibitors they appear to reduce the risk of recurrence, especially the spread of breast cancer to bones. In the past, treatment with tamoxifen or aromatase inhibitors was usually continued for 5 years. It's now thought that using an aromatase inhibitor for longer than 5 years reduces the risk of recurrence for women who have breast cancers which are more likely to recur. It's important to talk to your doctor about current recommendations for length of treatment in light of these new studies. Hormone receptor status is a very important part of the diagnosis of breast cancer. If a tumor is estrogen receptor positive (ER+) it means that estrogen is a "driver" in the growth of the cancer. Likewise, a tumor that is progesterone receptor positive (PG+) is driven by the presence of progesterone. Often, but not always, a tumor will be both ER+ and PG+ or ER- and PG-. For premenopausal women, blocking the estrogen receptor on breast cancer cells is the usual approach. For postmenopausal women, blocking the formation of estrogen in peripheral tissues by aromatase inhibitors is the usual approach. Using hormonal therapies for those with early stage estrogen receptor or progesterone receptor positives can significantly reduce the risk of recurrence. For women with metastatic breast cancer, hormonal therapies can increase life expectancy and often reduce the symptoms of the disease.